Originally from Grand Rapids Michigan, Gordy is a second generation PGA Golf Professional. He began his start in golf as a caddie working at a local club near his home. During his senior year in high school his parents purchased a 27 hole public golf course where he continued to work and learn the golf business. Gordy played two years of college golf at Kellogg Community College in Battle Creek Michigan and has been a PGA member since 1992. 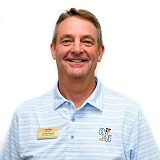 Gordy worked as a Head Golf Professional at Riverside Country Club in Battle Creek, MI, Ramshorn Country Club in Fremont, MI and a Golf Professional and General Manager at Alpena Golf Club in Alpena, MI for 21 years, before moving to Florida in 2015. He and his wife Terry moved to Florida to be closer to aging parents. They have two daughters; one in Florida and the other in their home state of Michigan. Both daughters are graduates of the University of Michigan and have families of their own. They are proud grandparents of two beautiful granddaughters and spoil them every chance they get. Gordy has spent time here in the Villages visiting his mother and father in-law who built their winter home in The Village of Country Club Hills back in the mid 80s. After many visits to the Villages, Gordy was determined to become a part of this great golf community. Please stop by and say hello to Gordy. His warm smile and outgoing personality will welcome you to Orange Blossom Hills Country Club. I have lived in the Villages for the last 7 years with my husband, Max. We have been married 47 years have two sons and two granddaughters who still reside in Indiana. I worked for General Motors Corporation for 31 years and during that time went from being an hourly employee to a department head coordinator. In addition to us both working full time in the manufacturing industry we also owned a working farm. I showed Quarter Horses from the time I was 10 years old allowing us to travel all over Indiana, Ohio and Illinois. I love to golf and travel and have worked for The Villages golf team since 2010. I have 35 years in the retail management field. I was Director of Stores in charge of retail operations with The Casual Male of Shrewsbury, MA and was responsible for the operations and personnel of 65 retail stores, throughout the Northeast. In 1985 I became Regional / Operations Manager with New England Golf & Tennis, dba Nevada Bob's operating 15 Golf & Tennis stores throughout New England, with my home office located in Walpole, MA. In 1997 I accepted the position as General Manager of Swansea Country Club, located in Swansea, MA and operated an 18 hole championship golf course and a 9 hole executive course. In 2003 I was appointed General Manager of Norton Country Club in Norton, MA a private 18 hole championship golf & country club. I am excited about the opportunity of working with the staff of Orange Blossom Hills and being an added asset to the team. I lived in Alaska for 35 years. I have two sons still living in Alaska, two sons in Reno and a daughter in Boise, Idaho. I retired from teaching science education, for 30 years, at the University level. My wife and I came to The Villages 5 years ago and have loved our lives here. I joined OBH in 2012 and really enjoy all the people who come to play.